Are you prepared to set yourself free? Dreams of being caged may sound quite simple to understand, but in reality they often prove more of a challenge than you might initially think. 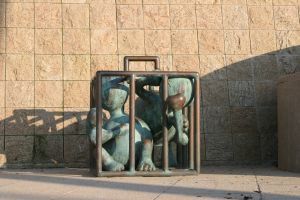 For while we can easily understand that a cage represents some kind of restriction or loss of freedom, knowing why the cage exists, and how to be released from it can be a lot more challenging indeed. When you dream of a cage, it can help to start by looking at who or what is in the cage. By using some of the other posts I have written you may begin to realise which aspect of yourself is caged. Is it a wild animal? Maybe your inner wild nature is being restricted. Is it another person? Maybe an aspect of your personality is being shut-off or caged. Dreams of being caged can also represent a difficulty your are facing in your waking life, where you feel circumstances do not allow you to be your real self, or where you are compromised in some way. Take a look and see how much of this is really out of your control, and how much you are complicit in what is going on. Are you just avoiding the confrontation or feel you lack the bravery it would take to change things? For while cages can seem like a prison to some, to others they can be a safe haven. Does the bird in the cage want to live there safe from the cat’s evil claws, or would it rather fly away to freedom? If you are the bird, what is it you really want? For others, the cage keeps the wild things safely hidden away. But remember, these are all simply aspects of yourself. If you are a lion, do you want to roar proudly, or cower in the dark in shame and humiliation? Where have we placed restrictions upon our-self? What self-limiting beliefs or behaviours are we exhibiting? Are you caged by your own thoughts? 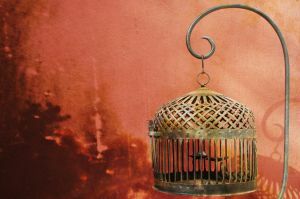 As soon as we begin to realise that we can cage our-selves with our own thoughts, dreams of being caged may become less distressing of frustrating. Often, we hold the key to our own release. Address these areas of your life, and see how your dreams may change to ones with symbols of freedom, such as running happily, dancing, flying or floating.